Above all else, the greatest gift and the most wondrous blessing hath ever been and will continue to be Wisdom. It is man’s unfailing Protector. It aideth him and strengtheneth him. Wisdom is God’s Emissary and the Revealer of His Name the Omniscient. Through it the loftiness of man’s station is made manifest and evident. It is all-knowing and the foremost Teacher in the school of existence. It is the Guide and is invested with high distinction. Thanks to its educating influence earthly beings have become imbued with a gem-like spirit which outshineth the heavens. In the city of justice it is the unrivalled Speaker Who, in the year nine, illumined the world with the joyful tidings of this Revelation. And it was this peerless Source of wisdom that at the beginning of the foundation of the world ascended the stair of inner meaning and when enthroned upon the pulpit of utterance, through the operation of the divine Will, proclaimed two words. The first heralded the promise of reward, while the second voiced the ominous warning of punishment. The promise gave rise to hope and the warning begat fear. Thus the basis of world order hath been firmly established upon these twin principles. Exalted is the Lord of Wisdom, the Possessor of Great Bounty. The light of men is Justice. Quench it not with the contrary winds of oppression and tyranny. The purpose of justice is the appearance of unity among men. The ocean of divine wisdom surgeth within this exalted word, while the books of the world cannot contain its inner significance. Were mankind to be adorned with this raiment, they would behold the daystar of the utterance, “On that day God will satisfy everyone out of His abundance,” shining resplendent above the horizon of the world. Appreciate ye the value of this utterance; it is a noble fruit that the Tree of the Pen of Glory hath yielded. Happy is the man that giveth ear unto it and observeth its precepts. Verily I say, whatever is sent down from the heaven of the Will of God is the means for the establishment of order in the world and the instrument for promoting unity and fellowship among its peoples. Thus hath the Tongue of this Wronged One spoken from His Most Great Prison. O ye men of wisdom among nations! Shut your eyes to estrangement, then fix your gaze upon unity. Cleave tenaciously unto that which will lead to the well-being and tranquility of all mankind. This span of earth is but one homeland and one habitation. It behooveth you to abandon vainglory which causeth alienation and to set your hearts on whatever will ensure harmony. In the estimation of the people of Bahá man’s glory lieth in his knowledge, his upright conduct, his praiseworthy character, his wisdom, and not in his nationality or rank. O people of the earth! Appreciate the value of this heavenly word. Indeed it may be likened unto a ship for the ocean of knowledge and a shining luminary for the realm of perception. O thou who dost search after truth! From the days of Adam until today, the religions of God have been made manifest, one following the other, and each one of them fulfilled its due function, revived mankind, and provided education and enlightenment. They freed the people from the darkness of the world of nature and ushered them into the brightness of the Kingdom. As each succeeding Faith and Law became revealed it remained for some centuries a richly fruitful tree and to it was committed the happiness of humankind. However, as the centuries rolled by, it aged, it flourished no more and put forth no fruit, wherefore was it then made young again. The religion of God is one religion, but it must ever be renewed. Moses, for example, was sent forth to man and He established a Law, and the Children of Israel, through that Mosaic Law, were delivered out of their ignorance and came into the light; they were lifted up from their abjectness and attained to a glory that fadeth not. Still, as the long years wore on, that radiance passed by, that splendor set, that bright day turned to night; and once that night grew triply dark, the star of the Messiah dawned, so that again a glory lit the world. Note thou carefully that in this world of being, all things must ever be made new. Look at the material world about thee, see how it hath now been renewed. The thoughts have changed, the ways of life have been revised, the sciences and arts show a new vigor, discoveries and inventions are new, perceptions are new. How then could such a vital power as religion—the guarantor of mankind’s great advances, the very means of attaining everlasting life, the fosterer of infinite excellence, the light of both worlds—not be made new? This would be incompatible with the grace and loving-kindness of the Lord. Religion, moreover, is not a series of beliefs, a set of customs; religion is the teachings of the Lord God, teachings which constitute the very life of humankind, which urge high thoughts upon the mind, refine the character, and lay the groundwork for man’s everlasting honor. “Know thou that in every age and dispensation all divine ordinances are changed and transformed according to the requirement of the time, except the law of love, which, like a fountain, always flows and is never overtaken by change.” BAHA’U’LLAH. In this day the victory of the faith is assured because of the spiritual Reality of the Oneness of the Two Worlds. This refers to the organic truth of the oneness of humanity to which the spiritually awake have direct and immediate access in their daily transactions within the Kingdom. In the same manner that we become “open gates” for the prayerful, the needy and the seeking to enter within the reality while we are in this life; we are also enabled to be conduits for the souls who remain in organic union with us–though they have already crossed over the veil. “Teaching the cause of God is the head cornerstone of the foundation itself” (W&T, p. 10). This takes many forms in both this world and the next. Even as we are active, open gates in this life–this shall continue in the next–even as those advanced adepts who have crossed over remain open conduits and protecting guides for us as well. God’s inscrutable decree enables receptive souls to be motivated by the prompting of the spirit as real agents of the Holy Spirit. Those directly in tune with this agency are responsible for the tasks and missions set before them. There is a continual, direct interchange and transaction between the souls in this world and the next that relates to the divine function of the Oneness of Humanity as the chief cornerstone of the Divine Economy in which we participate. In this connection “True Wealth” is, in reality nearness to God; the closer we each get to the Center–the closer we each get to one another. The reverse forces are possible as well, stagnation; separation, close-mindedness; fear of the impending reality based on false ideologies, erroneous indoctrination schemes, man-made conceptions and superstitious fears of the unknown. The advancement of the Cause of God in this day is advancement in the everlasting Law of the Divine Love. While protected and sheltered in the Kingdom of His love–our knowledge is free to deepen in the mysteries of the reality of the Kingdom. This type of knowledge–though capable of being expressed through logic–is based upon a deeper more foundational type of experiential knowing that the true believers experience in their own personal relationship within the presence of God when holding fast and firm to the cord of the everlasting Covenant of God. ‘Abdu’l-Baha explains that the: “magnet which attracts the bounties and confirmations in this day is the Covenant of God, and that it is the standard against which everything is to be judged… Should a person become the very personification of the Holy Spirit, and hesitate for an instant in the path of the Covenant, he would be truly of the legion of the lost” (‘Abdu’l-Baha, Tablet to Aqa Jamal, cf. ‘Abdu’l-Baha, H. M Balyuzi, p. 58). Now the majority of the peoples of the world are innocent of all of this. They know nothing about the Covenant in the least. They have received guidance from the previous Manifestations of God and proceed at their own various paces towards ultimate reunion whether that is attained in this world or the next. But the Baha’is are not innocent of this! They have received the specific instructions and teachings of the Covenant expressly given in this Day and Age–and tasted the fruits and gifts of the Powers from on High! 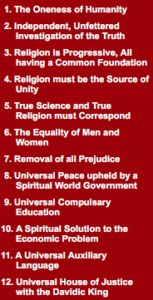 Should a Christian, or a Jew or Muslim (or anyone from any background) come into Contact with this Revelation of the Most great Name (through any of the 7 Rites of Baha’u’llah: http://uhj.net/bahai-faith-history.html)–they will assuredly be guided to the Covenant as actualized in the Living Community of the Covenant in this day. Then comes the test. They judge themselves worthy or unworthy, and then are no longer innocent. The Judgment Day depicted in the Christian scriptures is sometimes entitled “the Great White Throne Judgment” from the visions of the New Jerusalem recorded in the Book of Revelation. In Chapter 20-22 Jesus the High Priest, depicted as a Knight of Baha’u’llah and as “a Lamb as though he had been slain” is seen before the One seated upon the THRONE and among the elders. He, Jesus the High Priest, the Knight of Baha’u’llah opens the scroll sealed with seven seals from which the 7 Thunders of the Violations of the Covenant then resound. These 7 Thunders correspond with the 7 great World Wars of the 20th/21st century: (1) World War I; (2) The Great Russian Revolution; (3) World War II; (4) The Cold War–includes Korean War, Vietnam, South American War, African massacres, Afghanistan, etc. ; (5) Gulf War I–includes Trade Towers 1993; (6) Gulf War II–includes Trade Towers 2001, Afghanistan, Iraq and Current ongoing global War of Terror; (7) The onrushing thermonuclear War in which one third of humankind is prophesied to be killed in one hour with every American city with a population of 100,000 or more being targeted. This includes direct attacks on New York City, the UN Building, and the UN in general (see http://www.bupc.org/UN-bomb-plot.html). The death toll in last Friday’s bombing of the UN building in Abuja is now up to 23. 75 others were injured. This makes it the deadliest attack in UN history. One of the scariest and most disturbing trends for the United Nations is the way in which an international humanitarian organization has become a preferred target of Islamist extremists over the past ten years. The transformation has occurred remarkably quickly. Since the mid 1990s, Al Qaeda leaders like Ayman al Zawahiri and the late Osama bin Laden have constructed a narrative about the United Nations that paints the world body as implacably hostile to the interests of Muslims worldwide. They portray it as part of a global conspiracy to subjugate Muslims and promote the interests of the United States and the west. This narrative, which has been steadily built over the past 10 years or so, has been very consequential to the security of the United Nations. To be sure, UN peackeepers and aid workers have been shot at, kidnapped and killed in the past, but never before has the institution had to deal with the threat of terrorism. The first serious attack was the 2003 bombing of UN headquarters in Iraq, which killed 22 people. In December 2007, 17 people were killed in a twin suicide bombing attack on the UN headquarters in Algiers, Algeria. In Afghanistan and Pakistan the UN has been a frequent target as well. In October 2008, a suicide bomber struck the lobby of the Islamabad headquarters of the World Food Program, killing himself and five UN humanitarian workers. Three weeks later, a team of Taliban militants attacked a guesthouse in Kabul where UN election workers were stationed. In Somalia, Al Shabaab militants launched a suicide bombing attack on a UNDP compound in northern Somalia in 2008. Now, an al Qaeda inspired group, Boko Harum, is taking credit for this latest attack in Abuja. The trend is clear: Al Qaeda or groups that look to Al Qaeda for ideological inspiration are targeting the United Nations whenever, and wherever they can. If this trend continues–and there is no reason to think it will stop — the UN will become a real target wherever there is some sort of low-level Islamist insurgency. That’s a serious problem for the UN, which runs humanitarian or economic development programs throughout the Magrheb, Middle East, Africa and Asia. You expect a level of insecurity in conflict zones like Somalia, Afghanistan and Pakistan. But the attack on the UN compound in Abuja shows that the UN is a target very far from hot conflict zones. UN offices in Mali, Mauritania, Indonesia, or wherever al Qaeda inspired groups have a foothold, may be next. The judgment day is not God seated upon a throne, judging people sheep to the right, goats to the left—but it is the people judging themselves to be worthy or unworthy. They judge themselves as such through their words, choices and deeds. The doors of the Kingdom are always open. Many come and go freely as they please. This is not violation of the Covenant, but is the journey the people must take. In doing what they are going to do they will see the reality and make their ultimate choices bearing their own accountability in their own good time in relation to God and God alone. Now the Covenant-breakers think that attacking and belittling the Promised Ones (that includes the living guardians) they are going to get “brownie points” with God, so to speak. This isn’t the case and Dr. Jensen said their condition “would be hilarious if it wasn’t so pathetic!” Thus it states that they shall be judged by what they have done. Covenant breaking is the direct attack by those who are in the know and who had once tasted the wonders of the spirit. These Covenant breakers are those who then turn against the Covenant and Administration, the Supreme Institutions named in the Will and Testament of Abdu’l-Baha’ that are Divine in origin–the guardianship and house of justice; reject the core values, principles and attack the key & central figures in the Cause. Now part of the mission of the teachers, guides, and educators in the faith today is to make the world a better place, not worse–to be IN the world but NOT of it. On the mystic path we walk with practical feet, ‘Abdu’l-Baha tells us to make sure that every step we take is firm in the Covenant. This is the path of the Covenant, the road less travelled, the inner path that leads to reunion with the Divine. Our mission also includes within the contexts of our fellow Baha’is “saving the waverers” to use the phrase of Mason and Dr. Jensen. When Mason passed on, he left the inheritance of the guardianship to his only son Pepe, but in a letter written to Drs. Leland and Opal Jensen (which I read the original of myself when living at Talman in Chicago in the Spring and Summer of 1987) Mason left the full care of the Baha’i community to them. Mason wrote words to the effect that he knew Dr. Jensen’s father Christ Jensen (pronounced Chris) personally; and that the entire Jensen family was always imbued with spiritual qualities and attributes. Mason recognized their great teaching capacity and activity; and acknowledged specifically Dr. Jensen’s work as Knight of Baha’u’llah firm in the Covenant, most knowledgeable and leader (eldest living son) of the entire Jensen family. Mason wrote that should he himself pass on, he knew that the entire Baha’i world would remain safe and secure because of Dr. Leland Jensen. In fact, this is what has happened at that time. I have attached below a series of correspondence that gets more into the reality according to the Law of Primogeniture of how the natural branch of the exilarch (exiled monarchs of King David) family of Baha’u’llah and ‘Abdu’l-Baha was known in the Plan of God (and to Mason through ‘Abdu’l-Baha, and from Mason told to Pepe) who would “arise and qualify” through “another branch” (W&T, p. 14) of the throne-line of Bostanai the exilarch–a Jewish cadet branch of the Northern family of Baha’u’llah and ‘Abdu’l-Baha. Thus the Great White Throne Judgment has been upon the people especially since the year 2000/2001 AD when we discovered the location of Chair Mountain identified in the prophecies on Naw Ruz, 2000 AD (which is March 21, the Vernal Equinox) and unfurled the Divine Standard of the Genealogy of Baha’u’llah for the first time for all the world to see at the “New Castle Gathering” near New Castle, CO. This location turned out to be the fulfillment of the prophesied scene and location further corresponding to the prophesied date of the 9-11 Event when God brought forth His “servant the branch” (Aghsan: Zech. 3:8 kjv) during the “ten days” in September, 2001 AD. These dates spoken of in the Holy Bible and other Holy Scriptures, correspond with the Mayan and Azetc prophetic Calendars as well as those of Kali Yug, Hindu and Buddhist prophecies, those of China and the East, the Holy Cycles of Zoroaster, the Scandinavian and African traditions (the Great Pyramid is located in Africa) and the Holy Koran as well. Thus Judgment has fallen upon all the peoples of the world, meaning–through the projection of this message they now have the exciting and positive opportunity to see the FACTS, judge themselves WORTHY and enter therein. If they choose to remain outside: Jesus said, “shake the dust off your feet” and move on to the next one. For those who fail the test or refuse to enter: “it is no skin off my nose,” as Dr. Jensen was known to say. Before an electron makes the quantum leap to the next higher lever–it begins to receive vast amounts of energy. These overwhelming vibrations are experienced in the Cause of God as a tremendous “wavering in the covenant” and a violent “wavering in the faith.” In the analogy the electron will either pop out and instantaneously re-appear at the next level, or it will turn against the source of the increasing vibrations and heat up, die, implode, fall back out of its positions to some fragmented quarkian former state, and be replaced by something else. The point is this: the true believers should have no fears or insecurities in the Covenant when they feel the violent winds of these tests coming upon them, when their internal clock and systems begin to race on overload, they are not cracking up, but reviving the powers of God to make that quantum leap, if they put their trust wholly in God and God alone. I have been urging the Baha’is for many years now, to lay off the self-medicating through material means; and attempt to allow this process of transfiguration and transubstantiation to naturally take place. Unlike communities who value objective or subjective faith–‘Abdu’l-Baha teaches that our faith is to be DISCERNING FAITH (For more see: http://www.bupc.org/chinvat/chinvat-current-issue.html). This also means that we are to live these experiences with eyes wide open–not eyes wide shut! We must keep our eyes wide open while we die to the things of this world and come to live in the next. The extremely powerful forces unleashed by the potency of this Revelation are as transformative as they are destructive. These forces will inure the flexible and adaptable to move in the growth-oriented direction of personality. Those wrong egos clinging to rigid forms, systems, ideologies, reductionism, etc., when impacted by these same spiritual forces will not bend and shall all break. Shoghi Effendi calls this a twofold process: “the first,” he states, “is essentially an integrating process, while the second is fundamentally disruptive.” In order to harness these functions for the betterment of the planet ‘Abdu’l-Baha’ has delineated the Twin Institutions of the Guardianship and the House of Justice (the Legislative and Executive branches–the Amr and the Alim (named in the Kitab-i-‘Ahd)–the learned in El Baha) to deal with this: “through the close union and harmony of THESE TWO FORCES, the foundation of fairness and justice may become firm and strong, that all the regions of the world may become even as Paradise itself” (W&T, p. 15). “The first is essentially an integrating process, while the second is fundamentally disruptive. The former, as it steadily evolves, unfolds a System which may well serve as a pattern for that world polity toward which a strangely-disordered world is continually advancing; while the latter, as its disintegrating influence deepens, tends to tear down, with increasing violence, the antiquated barriers that seek to block humanity’s progress towards its destined goal.” (Shoghi Effendi, March 11, 1936, see WOB, pp. 170-171). Now these integrating and disruptive forces are initiated with God Himself; channeled through the heart, mind and soul and physiological make-up of the Supreme Manifestations of God; and subsequently canalized through the human nervous systems of all the people of the world; and impact upon individuals as “an integrating process” accompanied by a cleansing, essentially “disintegrating influence” and “disruptive” force. Now for my friends who are firm in the Covenant, who are beyond the previous “wavering stages” of the tests and assailments against these holy truths–I tell you the HOUR has come upon us! On the scale of one day equals one year (Num. 14:34; Ez. 4:6) a prophetical hour is about 15.22 days and on the scale of 1 day equals one year that makes about 15.22 years. It is now about 15.22 years since the 9-11 event. The ONE HOUR of Judgment has reached is fullest culmination. For over 15 years period without any interruption and without any delay! –The arguments have been given, the proofs established, the treatise explained; the dissertation recorded; the enemies refuted; the testimony completed; the individuals have chosen! They have chosen their allegiances, their loyalties, their friendships, who they wish to associate with, how they wish to live their lives. They have chosen sides and judged themselves worthy or unworthy to join what Dr. Jensen has described as God’s heavenly army. Now comes what is prophesied in all the holy books of God to transpire next! For many historians, these 7 Thunders of the 7 World Wars that I have already mentioned are in reality the people of the world repeatedly fighting World War I over and over again. The reason for this idea is that the Causes that were behind World War I were never resolved in that war. Thus studying the underlying problems behind World War I gives us a clear field of solutions to the current problems and states of affairs. Prophetically speaking ‘Abdu’l-Baha announced in 1912 that the War would start in 1914, and this would be the battle of Armageddon prophesied in the Bible (see http://uhj.net/end-time-prophecy.html). Thus from the birth of the Lamb, Dr. Jensen in August of 1914 until the present day–represents the unfolding of the dire events described in the Bible and Book of Revelation pertaining to the Battle of Armageddon. The first 5 thunders resounding from 1914 to the 9-11 Event in the year 2001 and the following two final Twin Thunders signalized by the gjallarhorn blasting of the 9-11 Collapse of the Twin Towers as foretold in our press releases and announced with clarity and absolute certainty on MCAT live television during that ten year period (1991-2001). Baha’u’llah, cf. Shoghi Effendi, The Promised Day Is Come! What can we as human beings say? What can be our reply? Our action? Our call to action? God declares in the Book of Revelation–and this is the great Day of the resurrection from out all the peoples of the world. Now that this signal “hour” has reach its culmination–this 15 years period expressly given in the sacred scriptures and verses–the aftershock of the spiritual nature of such an overwhelming endeavor, such a mile-stone in our work, such an accomplishment for the members of our loyal and active group–and in the face of unrelenting opposition from without and ignoble betrayals from within–how can we but not declare in Jesus’s own words: “Let the dead bury the dead!” and following Christ into the glorious Kingdom established in this world and continuing into the next–how can we not but REJOICE, and be exceedingly GLAD for these ARE the BLESSINGS and FAVOURS of God! The unity of humanity as taught by Bahá’u’lláh refers not only to men still in the flesh, but to all human beings, whether embodied or disembodied. Not only all men now living on the earth, but all in the spiritual world as well, are parts of one and the same organism and these two parts are intimately dependent, one on the other. Spiritual communion one with the other, far from being impossible or unnatural, is constant and inevitable. Those whose spiritual faculties are as yet undeveloped are unconscious of this vital connection, but as one’s faculties develop, communications with those beyond the veil gradually become more conscious and definite. To the Prophets and saints this spiritual communion is as familiar and real as are ordinary vision and conversation to the rest of mankind. O God, my God! Aid Thou Thy trusted servants to have loving and tender hearts. Help them to spread, amongst all the nations of the earth, the light of guidance that cometh from the Company on high. Verily Thou art the Strong, the Powerful, the Mighty, the All-Subduing, the Ever-Giving. Verily Thou art the Generous, the Gentle, the Tender, the Most Bountiful. O ye Cohorts of God! Praise be to God! —that the Blessed Perfection hath freed the necks from the bonds and fetters and released all from racial attachments by proclaiming, “Ye are all the fruits of one tree and the leaves of one branch.” Be ye kind to the human world, and be ye compassionate to the race of man, deal with the strangers as you deal with the friends, be ye gentle toward the outsiders as you are toward the beloved ones, know the enemy as the friend, look upon the satan as upon the angel, receive the unjust with the utmost love like unto a faithful one, and diffuse far and wide the fragrances of the musk of the gazelles of Kheta and Khotan to the nostrils of the ravenous wolves. Become ye a shelter and asylum to the fearful ones, be ye a cause of tranquility and cease to the souls and hearts of the agitated ones, impart ye strength to the helpless ones, be ye a remedy and antidote to the afflicted ones, and a physician and nurse to the sick ones. Serve ye for the promotion of peace and concord and establish in this transitory world the foundation of friendship, fidelity, reconciliation and truthfulness. O ye Cohorts of God! Strive ye that this human world may be changed into a luminous realm and this mound of earth become the Paradise of ABHA. Darkness hath environed the world upon all sides. Savage tempers and inclination predominate. The human world has become the battlefield of the rapacious savages and the arena of the heedless and ignorant ones. The souls are either bloodthirsty wolves or beasts with degenerate reason. They are either deadly poison, or worthless plants. There are a few souls who in reality have some humanitarian intentions and are thinking of the well-being and prosperity of human kind. You must in this instance (that is, service to humanity) sacrifice your lives, and in sacrificing your lives celebrate happiness and beatitude. Based upon the Explicit Holy Text and the clear and manifest proofs and evidences contained within, and in accordance with, the revealed statements of Baha’u’llah, ‘Abdu’l-Baha, and Shoghi Effendi, the Universal House of Justice shall be comprised of both men and women. 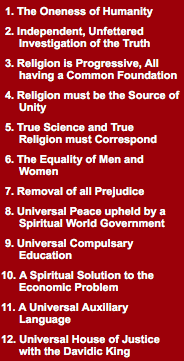 The membership of both men and women on the Universal House of Justice is constituted within the Baha’i Administrative Order, that is, the membership of both men and women on the Universal House of Justice forms an irremovable part of the constitution of the Universal House of Justice in all its stages. Prejudice—whether it be religious, racial, patriotic or political in its origin and aspect—is the destroyer of human foundations and opposed to the commands of God. God has sent forth His Prophets for the sole purpose of creating love and unity in the world of human hearts. All the heavenly Books are the written word of love. If they prove to be the cause of prejudice and human estrangement, they have become fruitless. Therefore, religious prejudice is especially opposed to the will and command of God. Racial and national prejudices which separate mankind into groups and branches, likewise, have a false and unjustifiable foundation, for all men are the children of Adam and essentially of one family. There should be no racial alienation or national division among humankind. Such distinctions as French, German, Persian, Anglo-Saxon are human and artificial; they have neither significance nor recognition in the estimation of God. In His estimate all are one, the children of one family; and God is equally kind to them. The earth has one surface. God has not divided this surface by boundaries and barriers to separate races and peoples. Man has set up and established these imaginary lines, giving to each restricted area a name and the limitation of a native land or nationhood. By this division and separation into groups and branches of mankind, prejudice is engendered which becomes a fruitful source of war and strife. Impelled by this prejudice, races and nations declare war against each other; the blood of the innocent is poured out, and the earth torn by violence. Therefore, it has been decreed by God in this day that these prejudices and differences shall be laid aside. All are commanded to seek the good pleasure of the Lord of unity, to follow His command and obey His will; in this way the world of humanity shall become illumined with the reality of love and reconciliation. Ye observe how the world is divided against itself, how many a land is red with blood and its very dust is caked with human gore. The fires of conflict have blazed so high that never in early times, not in the Middle Ages, not in recent centuries hath there ever been such a hideous war, a war that is even as millstones, taking for grain the skulls of men. Nay, even worse, for flourishing countries have been reduced to rubble, cities have been leveled with the ground, and many a once prosperous village hath been turned into ruin. Fathers have lost their sons, and sons their fathers. Mothers have wept away their hearts over dead children. Children have been orphaned, women left to wander, vagrants without a home. From every aspect, humankind hath sunken low. Loud are the piercing cries of fatherless children; loud the mothers’ anguished voices, reaching to the skies. And the breeding ground of all these tragedies is prejudice: prejudice of race and nation, of religion, of political opinion; and the root cause of prejudice is blind imitation of the past—imitation in religion, in racial attitudes, in national bias, in politics. So long as this aping of the past persisteth, just so long will the foundations of the social order be blown to the four winds, just so long will humanity be continually exposed to direst peril. Now, in such an illumined age as ours, when realities previously unknown to man have been laid bare, and the secrets of created things have been disclosed, and the Morn of Truth hath broken and lit up the world—is it admissible that men should be waging a frightful war that is bringing humanity down to ruin? No, by the Lord God! You are currently browsing the Baha'i Justice blog archives for January, 2017.